During his U.S. visit, Pope Francis will spend one day in New York City, a metro area with a large Catholic population—36 percent to be exact, making it much more Catholic than the rest of the country (22 percent). New analysis of the American Values Atlas (AVA) allows us to take a closer look at the religious make-up of New York City, including four of its boroughs. What it reveals is an incredibly diverse Catholic population that looks more like the Catholic Church’s future than its past. When just looking at New York City proper, half (15 percent) of the 30 percent of Catholics identify as Hispanic, while less than half (11 percent) identify as white. 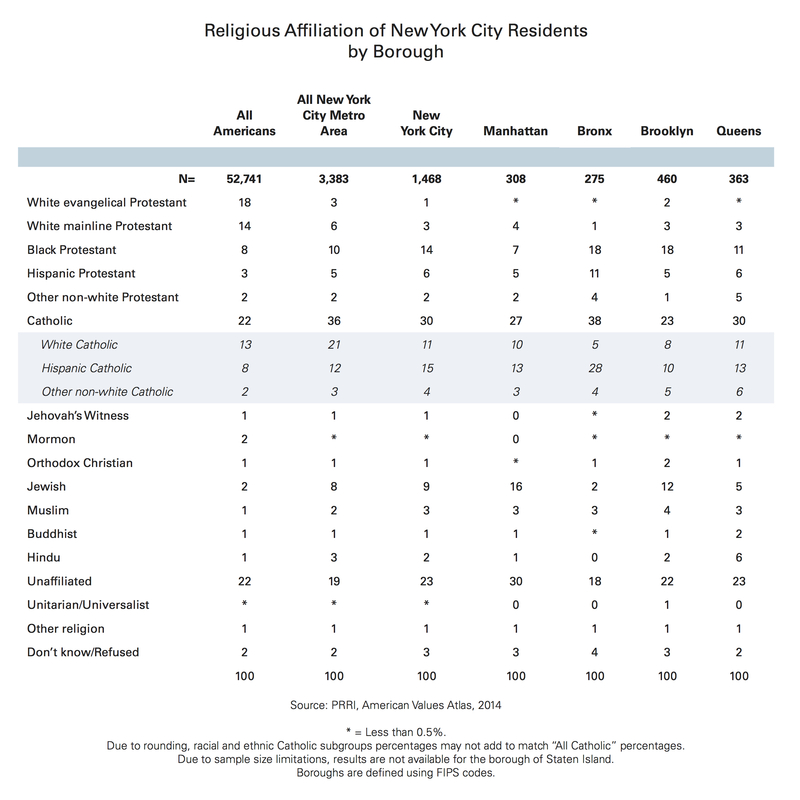 However, there is substantial diversity between the boroughs in the size and diversity of the Catholic population. New York Catholics are the most heavily concentrated in the Bronx, where nearly four in ten (38 percent) identify as such. Bronx Catholics are also overwhelmingly Hispanic (28 percent), with only five percent identifying as white, non-Hispanic and four percent as another race or ethnicity. In the Bronx, residents are much more likely to be Catholic than religiously unaffiliated (38 percent vs. 18 percent, respectively). In contrast, fewer than one in four (23 percent) residents of Brooklyn identify as Catholic—roughly similar to the number of residents who are religiously unaffiliated (22 percent). Explore more of the American Values Atlas here. Metro areas are based on U.S. Census Bureau definitions of Metropolitan Statistical Areas (MSAs). The metro areas may include both urban and non-urban populations. For instance, the Boston metro area encompasses the Boston-Cambridge-Newton, MA-NH Metropolitan Statistical Area.